There’s a certain pride inherent in being first. An inflation of the ego, an implication of winning, of being better. Everyone wants to be first sometimes. One day I hope to put up a first ascent on an inspiring feature or mountain, and I’m sure I will. For now however, I’ll have to be satisfied with my own made up firsts: First Traverses. 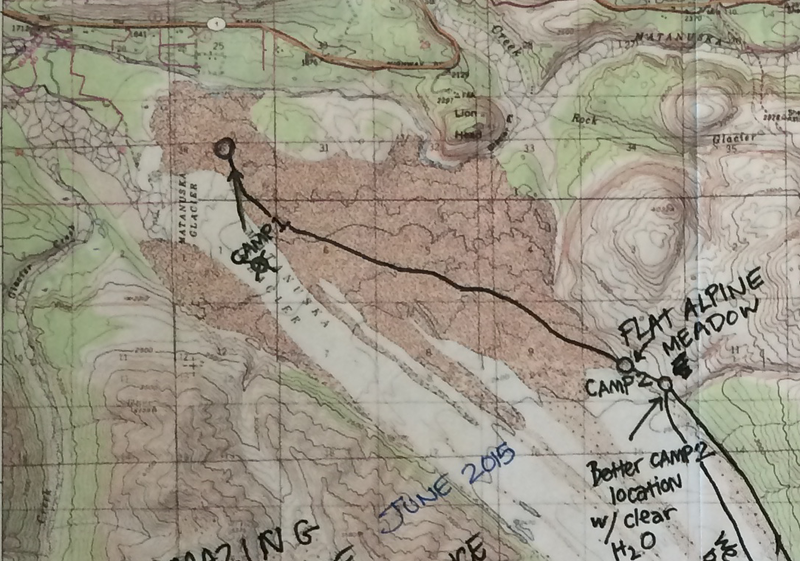 I recently completed a 5 day backcountry trip in the Matanuska area of the Chugach Range in Alaska as an instructor for the Mountain Training School. Although we climbed no technical terrain, stood on no summits, and generally just walked I still feel as though we painted an aesthetic line on the landscape much like an alpinist might on an mountain face. I am ‘claiming’ this as a first traverse with no delusion of the trips importance (or lack thereof), in fact I wouldn’t be surprised if people have done this same exact trip in the past. However the way my teammates and I experienced it, without any information or beta, we where first, we had fun, and in that spirit, I am writing this post. Our implied responsibility as First Traversers is to give our route a name and provide some beta. Here is our ‘topo’. We started this day from a camp in the moraine about a half hour from the parking lot (we had been doing some ice climbing on the glacier for a few days). From our camp we went slightly south of east for 7.5km to the opposite side of the glacier. For the first few hours the moraine was quite broken up and forward progress required a good deal of up/down, left/right, and even some backwards travel. Continuing east, travel got easier and we were able to move quickly and make quite good time to the far bank of the glacier. We found ourselves a very nice flat and sandy spot just off the moraine. In hindsight we should have traveled further on this day as it was pretty short and we could have saved ourselves some trouble in the coming days. This was a bit of a tricky day. We encountered our first real challenge of the trip and ended up having to do some fun problem solving. 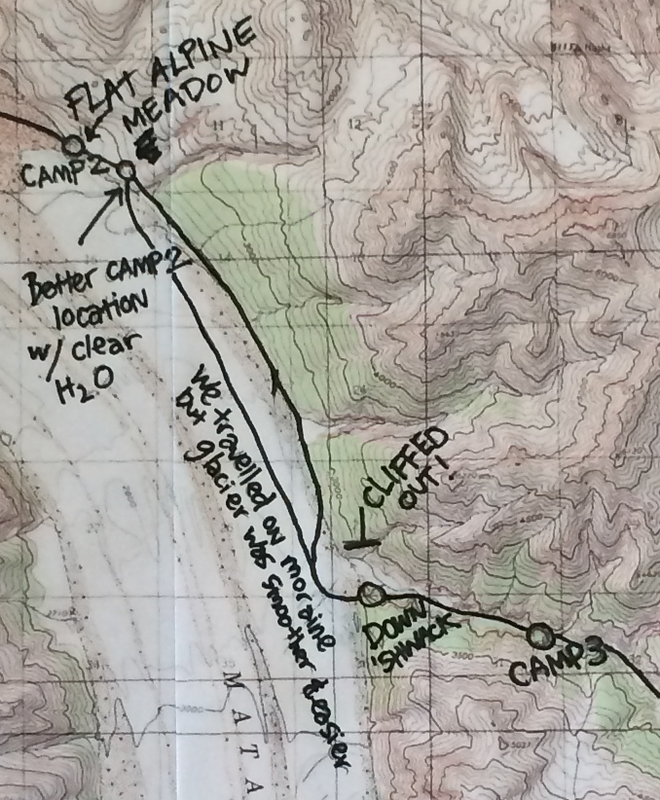 We traveled southeast just off the glaciers edge on relatively easy terrain. The ice would have been much easier to travel on but we doubted we would be able to find a way off. As we reached the opening of what would turn out to be Spoon Valley, we realized we were quite “cliffed out” and had no way of reaching the valley bottom. From our vantage point we could see a path that might work out on the glacial ice. We backtracked a km or two and found our way onto the glacier with a bit of climbing. From there we continued to the south side of Spoon valley and navigated the slightly broken up ice to get off the glacier and onto the moraine. Getting down to the rivers edge then required a steep descending bushwhack. We pushed a bit further in the heat trying to find a less muddy water option than the main river. This ended up being quite a burly day as anticipated and is the reason I think we should have pushed further on day one (in hindsight). We continued travelling up the valley (east) along the flat dry river bed crossing the river some six times as rocky bluffs would stop our travel on one side or the other. After about 4km we came to the confluence of two sub-rivers that created the mud stream we had been following. From here we could see our beloved pass, the highpoint of our traverse yet only the midpoint of our day. The students decided to make somewhat of a straight shot for the pass neglecting to take a few minutes to scout the continuation of the riverbed. Alas we headed that way and much to our surprise found a small hunting shack. It had clearly been abandoned for a while and had taken a beating by some bears. Entering the shack we found a large wooden spoon that said “Welcome to Spoon Valley”, inspiring part of our name for the trip. The shack seemed to be accessed by heli/bushplane. We carried on toward the pass crossing many ravines cutting down to the river. The going wasn’t too bad thanks to animal trail but the ravines proved a bit hazardous and tiring. When we finally reached the pass we were all a bit knackered. We could now see that the river would have made for pretty good travel. From the pass we descended toward the South Fork Matanuska River (get it? Spoon+Fork=Spork) which turned into its own sort of hell. A sudden thunder/rain storm motivated us off the high ground and we followed a new stream for a while before it got quite steep. 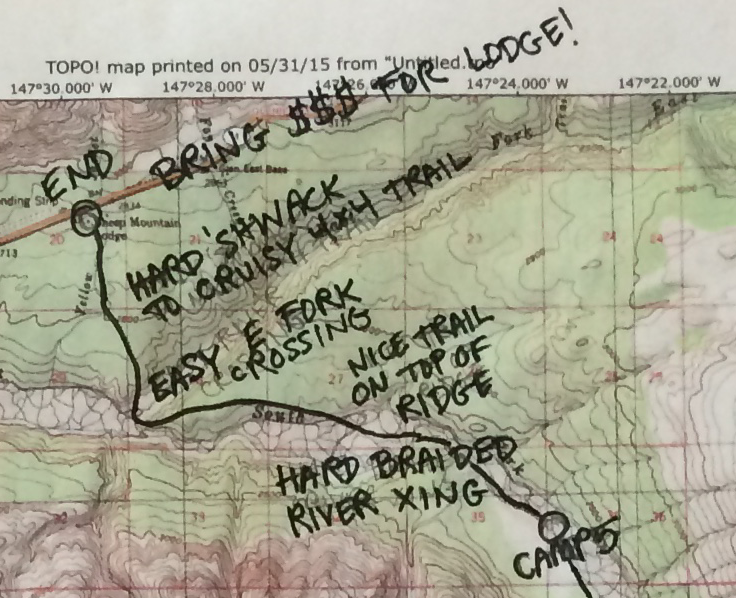 We headed up to a mini-saddle and began a wet and heinous 2 hour death march bushwhack down to the river. The day took us about 13 hours. This was a nice and cruisy day after our haul the day before. 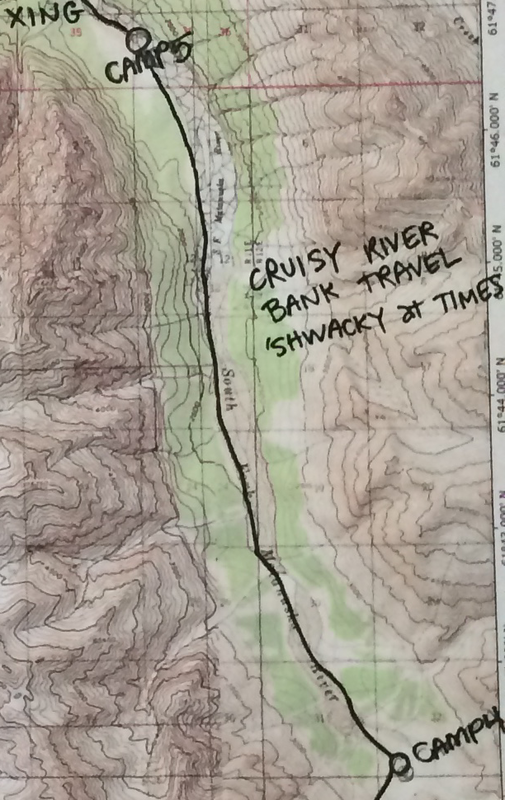 Staying on the west bank of the South Fork Matanuska River we traveled on mellow river bed occasionally being pushed up into some bushy terrain with decent animal trails. Tricky start to our final day. We got moving from camp at 4am as we knew we would need to cross the river and it was quite intimidating. Inspecting the map the night before, we decided to continue on the west bank a few km until after a natural widening of the river bed, hoping that the river would be more braided (broken into smaller pieces) there. We did just that and after about 1.5 hours of attempting many many team crossings, we finally stitched together a doable route across. Our legs felt like wooden stumps from the cold water and after a quick draining of the boots we continued on as we would soon have to cross the East Fork Matanuska River. Climbing up the bluff on our new side of the river we found a quality moose trail that lead us west toward the confluence of the East and South Forks. The East Fork proved quite easy after our battle with the South. After relaxing on the far side and spotting a small black bear, we climbed up the bluff on the north side of the river and bee-lined it on good trails to the Sheep Mountain Lodge for a well deserved meal. We had very good (hot) weather for this whole trip. This allowed for pretty easy travel but also led to high flow rates of the rivers. 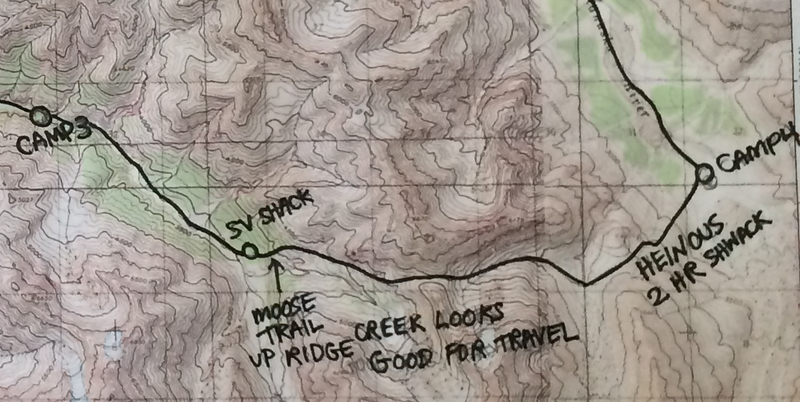 We were constantly following and camping near bear, moose, and other animal tracks. Bring bear spray and use all precautions. If you actually want to do this trip (it was fun!) let me know and I can give you more beta, GPS data, and Google Earth Tracks. Pretty righteous! Great effort to all concerned. Thanks bud. Nothing to write home about really…. and yet I wrote about it. hmmmmm…. Next Next post: Cool Story Bro… but you effed up.